This post is a very special one for a very special lady….Ashley from Center Cut Cook. You may have seen me link to her blog in the past because she is the creator of the amazing chocolate lasagna recipe! Well, outside of lasagnas and the kitchen, Ashley has been fighting some more serious battles. She is an incredibly brave, strong woman and is nothing short of AMAZING! Her husband Ryan was diagnosed with Stage 4 colon cancer at 29 years and their son Miles needs a kidney & liver transplant. Miles is a gorgeous little boy with blue eyes that could light up the entire sky! Please help by joining Team Ryan as we support Ryan and Miles. Ashley, you are a role-model to us all. You are Superwoman and we send love, prayers & hugs to your family! 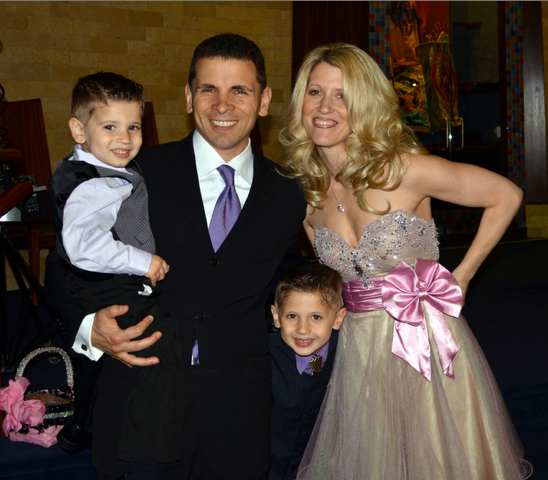 You can follow Ashley and her family on her blog and facebook page! In honor of Ashley, the blogging community is coming together to share some meals that you could bring to a friend in need. 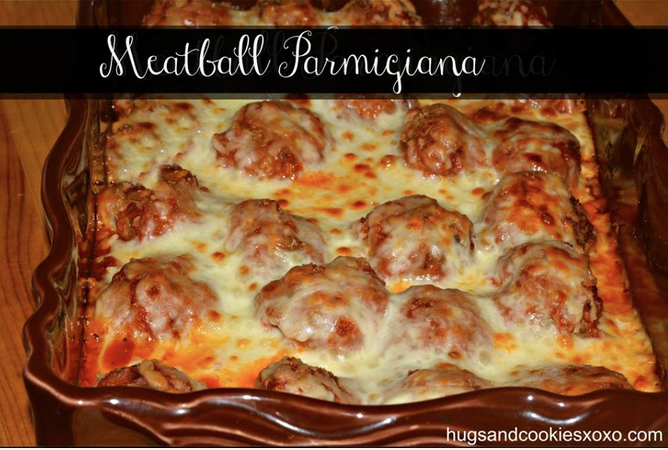 I have chosen my baked meatball parmesan because it is a perfect dish of comforting food! You could serve it with pasta or right into some delicious subs to make heros! 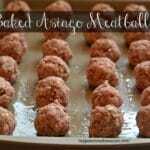 These meatballs freeze beautifully and reheat like they were made that day! I hope you enjoy them as much as we do! 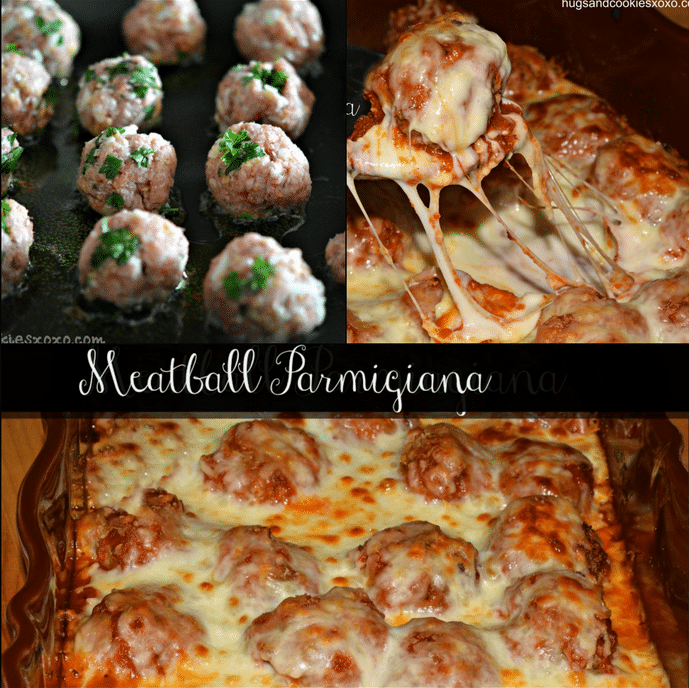 Mix all of the above meatball ingredients and form your meatballs-not too large. 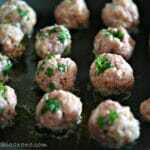 Pour 1-2 Tablespoons oil on a baking stone or pan with sides and bake meatballs at 400 for 20 minutes. Pour some sauce in the bottom of your dish(es). I used a ceramic dish pictured above or you could use one 9×13. Lay meatballs on top of the sauce. Cover with more sauce and dress the top up with lots of mozzarella! It should be covered with cheese!!! Cover with foil and bake for 20 mins. 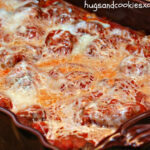 Remove foil and bake an additional 20 mins or until meatballs are cooked through and cheese is browning. For the last 4 minutes I raised the oven temp to 400 to help the browning. Gahhh those meatballs look amazing!!!! I’m so glad you were able to participate – thank you so much for sharing Ashley’s story and this totally terrific recipe!! 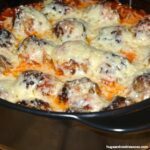 OMG I LOVE meatballs and cheese and the thought of all of that together in one pan is making my stomach grumble! I’m so hungry now!!! Great working with you on this project too! Thank you-I will be over to visit your delicious dish! This looks fabulous! I love Italian food, especially meatballs! Love that you used them in the lasagna. I enjoyed working with all you girls on the Wagner project…praying for miracles! I’ve just loved all the recipes everyone came up with for this great family! I’m hoping we were able to raise awareness and make a difference for them! They don’t sell meatloaf mix around here and I can’t recall ever seeing ground veal. What proportions of each should I use since I will have to buy separately? 1/3 lb each? Thanks so much and many prayers going up! I’m confused… the way the recipe reads I should put the oil in my pan and then bake the pan, empty… am I missing something? Why would I bake an empty pan for 20 minutes?? These meatballs/casserole was so good. Meatballs very tasty and moist. Will definitly make these again. Thanks Danielle. So glad u liked them! I want to know why I stopped receiving recipes from this web page ? If you don’t open the emails that come then it automatically removes you from the list. Glad you’re back! Oh yes, this looks so deliciously cheesy and comforting. It’s exactly what I need in this cold weather!